You can still order your digital copy of the best-selling tiny house movement book. Over sixty celebrants and leaders of the Tiny House Movement have come together to embody the spirit of human scale living in one amazing book. 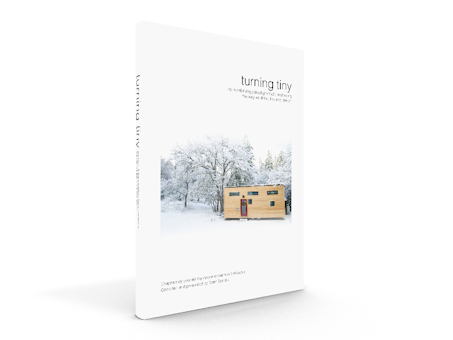 Turning Tiny, a collection of stories from some of the most renowned tiny house thought leaders and luminaries was unveiled before the 2016 Tiny House Jamboree. This compilation book came about because of the amazing stories I have been following on social media for the past few years. Those stories literally came to life for me at the little event last summer that came to define the tiny house movement and its people: the Tiny House Jamboree of 2015. It was an unbelievable time; magical, and life changing for so many people. It was like the first family get-together of an entire movement. Most of us there knew that this was the start of something greater than a singular event or even a “movement”. Out of the hundreds of stories that came out during the Jamboree at least some had to be shared and even memorialized. Some stories were old, some were being retold with more detail, and some were just starting. How to choose? Turning Tiny is just a small fraction of them. We knew even that August that we needed something to look back on; a way to relive the stories over and over. We also needed something to start from. Who knows where it will go from here. That’s the fun part! First and foremost, I would like to acknowledge the entire tiny house community who has both humbled me and inspired me with their vision, their passion, their mission, their lives, their dreams, and yes, their houses. I would like to thank Andrew and Gabriella Morrison who inspired me and encouraged me to jump into this craziness, and Andrew Stewart who gave me an early vision of what a tiny house community could look like, and helping me to create that vision. And I would especially like to thank the Turning Tiny section coordinators: B.A. Norrgard, Kim Kasl, Gabriella Morrison, Andrew Odom, and Frieda Bakker, for their dedication, time, and energy. Certainly though, much praise goes to Andrew Odom, without whose help organizing and coordinating this project, we would not have been able to pull off Turning Tiny. I truly bit off more than I could chew, and Andrew was my sanity. Thank you all! Have fun turning tiny!